"Cliff Lede: Unrivaled Winery and Winemaking Team (Petrus, Haut Brion, Bryant Family, Harlan, Araujo) in Stags Leap District "
This is a walk-around tasting event, you may come by anytime between 2:00 PM and 5:00 PM. There will be an assortment of artisanal cheeses and charcuteries at the tasting along with fresh Acme bread! The winery was established in 2002, when Canadian businessman Cliff Lede purchased 60 acres of vineyards in the famed Stags Leap District. In the following years, Lede formed an unrivaled team to make the most of this remarkable property. First onboard was noted viticulturist David Abreu, known for his work with Screaming Eagle, Harlan, Araujo and Bryant. Michelle Edwards, who had fashioned the previous three vintages at Colgin, was then hired as Winemaker November 2004, a position she held until January 2010. Consultant Michel Rolland, recognized for his contributions to such famed estates as Ornellaia, Harlan and ChÃ¢teau Le Bon Pasteur, was retained in 2005. Finally, famed winemaker Philippe Melka joined Cliff Lede Vineyards as Consulting Winemaker in March 2010. Completed in time for crush 2005, the state-of-the-art gravity-flow winery boasts a berry-by-berry sorting system and conical tanks commissioned using a design borrowed from Chateau Latour. One tank per vineyard block ensures each lot evolves at its own pace and acres of caves with single-layer barrel storage ensure access to each barrel at all times. No corner has been cut. The winery produces Sauvignon Blanc and Cabernet Sauvignon. The flagship, Poetry Cabernet Sauvignon, is crafted from the steep hillside portion of the estate. 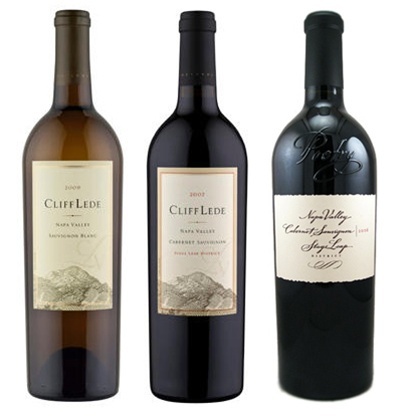 The land, the talent, the tools and the passion: Cliff Lede Vineyards, a notable addition to the Stags Leap District. Melka is recognized as one of the wine industry's leading winemakers: Robert Parker named him one of the world's nine most important winemakers, while Food & Wine declared him "winemaker of the year"� in 2005. Melka has worked for some of the most prestigious wineries in the world: Chateau Haut Brion and Chateau Petrus in Bordeaux and Dominus Estate in Napa. For the past 15 years, Melka has consulted for some of Napa's top properties, including Vineyard 29, Hundred Acre, Bryant Family, Dana Estates and Gemstone Vineyard. "I am very excited about the opportunity to work with Cliff Lede, which world class vineyard sites located in one of my favorite appellations, Stags Leap District, at a state-of-the-art wineryand with an amazing team,"� said Melka. Additionally Assistant Winemaker Kale Anderson has been promoted to Associate Winemaker and will have greater operational responsibility. If you would like to attend, please select the ticket option, and the quantity of tickets you would like and add them to your basket above. Print out a copy of your invoice and bring it with you the day of the event for admittance. If you are buying more then one ticket, please reply to the receipt that will be emailed to you, and give us the full name of the other members in your party. This is simply for name badge and attendee list purposes. We thank you for your support, and are looking forward to seeing you there.